A flip open compact that has two mirrors and is made from two types of wood. The Combo Pocket Mirror has one mirror magnifies and another that is a standard mirror. 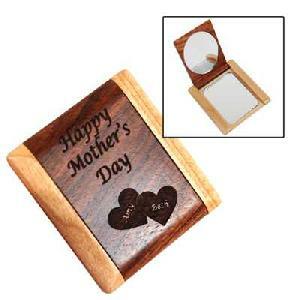 The thin design is made from Rosewood and Maple and has a large area for engraving messages. The clear finished woods engrave with excellent contrast, perfect for text, clip art and logos. 2-3/4" x 3" x 1/4"